There’s not a single pop-culture meteorologist who could have predicted the strange career path of Brooklyn hip-hop crew Das Racist. The group first gained national attention in 2009 with “Combination Pizza Hut And Taco Bell,” an irresistible, sharp pop gem camouflaged by an absurdly cloying aura thanks to its unforgettable chorus. 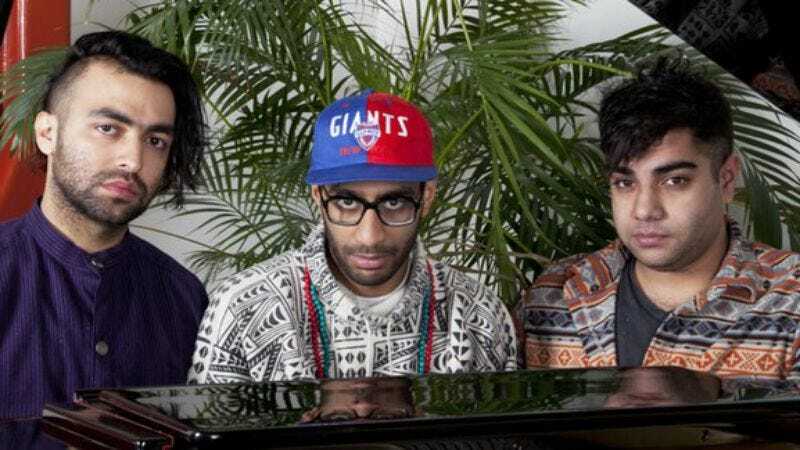 The following year, Das Racist dropped two excellent mix-tapes—Shut Up, Dude and Sit Down, Man—that showcased the skilled wordplay and quick-witted spitting of core duo Himanshu Suri (also known as Heems) and Victor Vazquez (Kool A.D.). This year the MCs, along with hype man Ashok Kondabolu (Dap), released their official debut album, Relax, an effort that streamlines the group’s hilarious and compelling spin on race, history, pop culture, and hip-hop into a radio-friendly style. In just a few years Das Racist has evolved into the kind of complex act every ethnomusicologist dreams of writing a book-length thesis about. Before Das Racist plays the TLA tonight, The A.V. Club asked Suri and Vazquez to reflect on their hip-hop project’s ever-changing dynamic by discussing how different outlets have described the group. Himanshu Suri: That one, it’s sort of interesting ’cause obviously people think we are—well, one of us is black. One of us is Indian. So it’s weird. People think we’re Arab. That was an article on black hipsters, so I just really didn’t understand why anyone was asking us anything about that. The A.V. Club: So why did you talk to them? To clear the air? HS: Almost any time we talk with somebody from the press, the idea is that it will lead to us making money by people buying records or that it will help make people want to buy tickets to the show. This was one where we were trying to—it was like 2008 or something; we just did it. We weren’t going to be selective. You know, when people write about you, you don’t really get to set the record straight. But to a certain extent, yeah. People from, I wouldn’t think “’hood or gated communities,” but I would say that, yeah. I mean, it [speaks to] a bunch of different types of people, whether it’s like college kids or whatever. HS: I think Jon [Caramanica] is a good writer, but I think the bit about the Obama administration, joke-rap at liberal arts colleges was weird. Maybe there are a lot of liberal arts college humorists that get down with rap groups. I just don’t know of any of them. It’s accurate enough. We like rap a bunch. We did it. AVC: Why do you think that’s weird? HS: I don’t know that there are a lot of weird college humorists. I know he’s obviously trying to not be literal, but if you want to know about what real liberal arts joke-rap kind of groups are out there, how many other ones? Maybe on other college campuses there are, but I don’t see it really. AVC: Was that weird to be described as a meme? Victor Vazquez: Nah, it was pretty true. AVC: Was that a chip on your shoulder you had to work against? VV: Nah. You can call it a meme. It is what it is. I’m not mad. It’s the reason that we’re being paid to do this right now. AVC: You have two mix-tapes and an album now. Do you feel like you’ve surpassed the point in your career where people just see you for the small chance you might play “Combination Pizza Hut And Taco Bell”? VV: I would say, yeah, that’s true. AVC: Having released more music since then, do you think people are more aware of the racial complexities you bring up in your music? VV: I’m not sure if I care. AVC: Why don’t you care? VV: I feel like, I guess I care. I get kind of tired talking about it, and that it could just be that I have a job that’s very easy and cushy. VV: I think that the definition of music doesn’t need to exclude the idea of an inside joke or a reference or absurd performance. AVC: As far as making those one and the same, have you succeeded in what you were trying to do? VV: I don’t know that we were trying to do that. We were basically trying to make an album that was kinda poppy that was us, and then also make it something that we just like. So I think we did that. VV: Yeah, that sounds like a possibility. AVC: Have you guys discussed disbanding? VV: Sometimes, but I don’t know. We don’t have a plan in terms of that. AVC: You’re all putting out solo mix-tapes soon. Do you plan on continuing music, period? VV: Yeah, I would like to continue doing music.